On one of our trips to Cochin, we decided to just walk around the streets with camera in hand. The place in itself is very pretty and colourful so we were confident that we would come back with some good pictures. However, as we walked around the place, we were were amazed at the number of opportunities that were there to photograph. Almost every 15-20 steps we were stopping, finding a subject and clicking. The greenery and the trees were a lovely contrast in a blue sky in which fluffy clods floated; the old churches, the backwaters, fishing boats, tourists…they all made lovely pictures and we will post some more of these pictures soon. Even the walls had colourful drawings on them, but probably the one thing that stood out most for us was the graffiti on this particular wall. 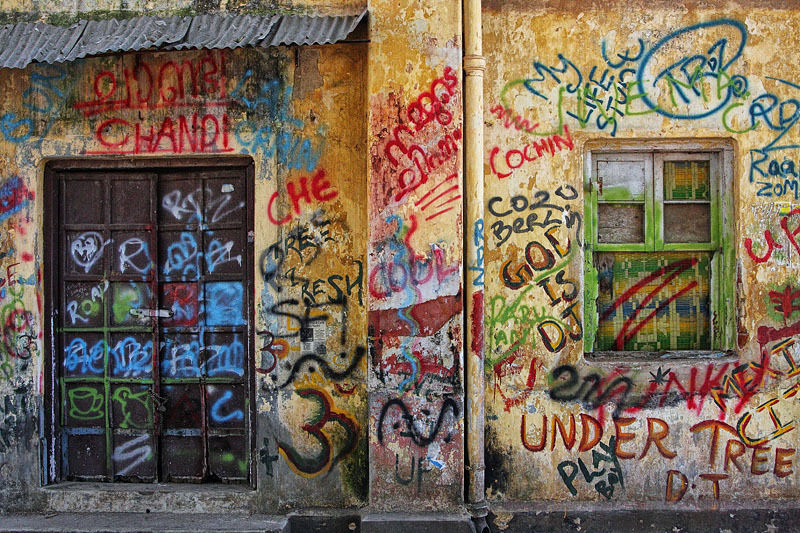 The building was old and in a run down condition, the windows were falling off, (some had already gone and were replaced with boards); but the walls were as colourful as ever with different writings in blue, green, red, black, orange, white…someone had taken a lot of trouble to decorate these walls. Opportunities to photograph are everywhere. You just have to look for them ! This entry was posted in Street Photography, Travel and Leisure and tagged backwaters, buildings, church, clouds, Cochin, colour, India, Kerala, paint, streets, tourists, trees, walk, wall, writing on January 27, 2014 by pkphotography.